Salt water pool filters are an important part of creating a clean and healthy pool. With proper filtration you will be sure to remove unwanted dirt and debris that nobody wants floating around while they are trying to have a nice relaxing swim. There are three main types of filtration that all work great in tandem with a salt water system. Electrolytic pool cells are often mistakingly referred to as salt water filters but they in fact don't filter anything they convert the existing salt in your pool water into low levels or chlorine through the process of electrolysis. If you want more information about filters that work great in salt water systems continue reading for some helpful tips and advice including our salt water filter comparison chart. A sand pool filter is the most common form of filtration mainly because they are affordable and provide good filtration at an affordable price. 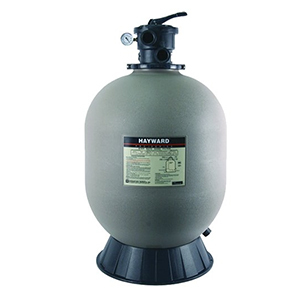 Sand filters are also versatile and can be used in almost any application whether it's a hot tub, above ground pool or a large community pool like what you would find in a residential complex, hotel or waterpark. The main drawbacks to sand filters is that they have the poorest filtration of all the filters and require a weekly or biweekly backwash. Sand filters provide filtration down to 40 microns in size compared to de filters that provide filtration down to 5 microns in size. Cartridge filters are popular because of their high level of filtration that includes particles down to 10 microns in size. This puts their filtration about four times better than sand but only about half as good as diatomaceous earth. A cartridge filter uses paper filters that can be cleaned for several years before they need to be replaced. There is no backwash needed which means less maintenance and of course you'd be helping the environment by conserving water. The units themselves are very easy to maintain and repair but the upfront cost is a bit higher than the other options available. 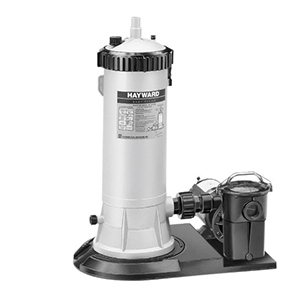 When it comes to salt water pool filters we recommend this type of filtration for its overall quality and level of maintenance. D.E. pool filters get their name from the diatomaceous earth powder used for filtration. They provide the best filtration of all the models which is usually in excess of 5 microns in size. The level of filtration is unmatched and are used to create some of the cleanest water you'll ever see. Salt systems that uses D.E. filtration will create superior water quality that is sure to be noticed by anyone that uses your pool. The main drawback to D.E. pool filters is that they can be complicated to operate and difficult to maintain. In the unfortunate event that you need repairs they are expensive to repair and replace. In recent years there is a push to have them eliminated in some municipalities due to the potential environmental hazard that diatomaceous earth poses. The 3 main types of filters that can be used with your salt system are sand, cartridge and diatomaceous earth or D.E. When considering each type of filter for your salt water pool they each have their distinct advantages, ideal application and disadvantages. There are several things that should be considered including pool size, bather load or usage, filter quality, and maintenance. If you would like to learn more about the specific types of salt water pool filters be sure to follow the links provided. Information about each type of filter is available including proper maintenance, cleaning and product recommendations. Sand filtration is the most common filter in residential pools for it's low cost and maintenance. The filtration isn't as good as other methods but adequate for most pools. This type of filter used pool sand as well as some new alternatives to sand that work extremely well with salt water systems and will help you achieve crystal clear water. 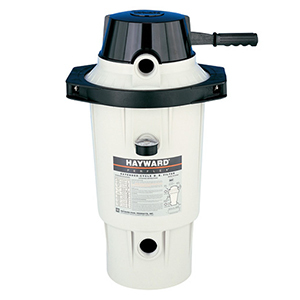 A cartridge filter system will provide mid level filtration and are ideal for residential pools. The filters are easy to replace and the unit itself is easy to maintain because of it's simple operation. The cartridges are relatively inexpensive and are sold in multi-packs for convenience and affordability. De filters are the cadillac of filters for their ability to filter down to 5 microns. They do require a monthly backwash and some systems can be a bit complicated for pool owners. They are a great option for luxury pools with low to average usage and an overall great filter system for pool owners that want the absolute best. We recommend following the links above for more detailed information about each type of filtration. This comparison chart provides a brief overview of the advantages and disadvantages of each type of salt water pool filters you can use with your salt water pool.